Since President Donald Trump’s election, conservationists have been worried about the potential for wildlife protections to be scaled back in the name of economic growth. Also worried is a Native American tribe in northern California that has been working for over a decade to reintroduce the nearly extinct California condor, the largest land bird in North America, back into the wild. Alarm bells are ringing over what Trump and his federal appointee for the Department of Interior (DOI) will mean for the Endangered Species Act (ESA). Wildlife advocates worry that some species could disappear forever if those protections were scaled back, especially amid what some have called an extinction crisis. While Trump hasn’t said anything specific about dismantling the ESA, Republican lawmakers introduced over one hundred bills last year trying to weaken the act. They believe the act—which allows for conservation of endangered or threatened species and the conservation of the ecosystems they need—stunts economic development and transfers control of public lands to the federal government. Trump’s appointee for head of the DOI, Ryan Zinke, is in charge of the U.S. Fish and Wildlife Service (USFWS) which oversees of implementation of the ESA. Despite that, Zinke has voted in the past to get rid of some protections under the act — worrying conservationists. Amid this shift to the right in politics, the Yurok Tribe in Klamath, CA, has been working to reintroduce a species absent from their skies for more than a century. The California condor has a wingspan of about 10 feet and lives up to 60 years. The condor used to range from Baja California to British Columbia, but factors including loss of habitat and lead poisoning meant they were nearly extinct by the 1980s. Since they are scavengers that eat carrion, California condors can be poisoned by ingesting lead bullets and fishing tackle embedded in the meat. There are less than 500 individuals left in captivity and the wild. In 2003, the Yurok Tribe voted to reintroduce the condors on their land. Biologists hired by the tribe found the area would support the birds. After that, the National Park Service (NPS), USFWS, and the Yurok tribe partnered to reintroduce California condors to the Redwood National Park in California. They’re currently engaged in the National Environmental Policy Act (NEPA) in which they evaluate the viability of the plan, and they started having public comment meetings on the proposal in January. in this photo taken on Friday, Aug. 7, 2009, Yurok Tribe wildlife biotechnician Tiana Williams holds a turkey vulture in the hills above Orick, Calif., where it was trapped as part of the tribe's efforts to determine if the Klamath River canyon would be suitable habitat for condors. Lead poisoning is the leading cause of death in condors in the wild, and the tribe is taking blood samples to see if the turkey vultures are feeding on carcasses shot by lead bullets. The tribe's culture is based on the idea of regularly trying to fix what is wrong with the world, and bringing back the condor is part of that belief. With Trump’s election, and his appointment of Zinke as DOI head, there is uncertainty about the future of environmental and wildlife protections. Some worry that federal funding for the program and others like it could be cut under Trump. The USFWS-led California condor reintroduction program, which has seen success since it began in 1987, costs hundreds of thousands to administer. In addition to voting to get rid of some ESA protections, Zinke has made efforts to expand oil and gas development on public lands and to exempt agribusiness from protections under the ESA. While Zinke’s record amid a Republican-controlled Congress has conservationists worried, a spokesperson for Zinke said he is still meeting with various stakeholders to learn more about their programs and looks forward to learning more about the effort. “The Secretary is still meeting with individuals from various agencies and bureaus and learning more about their programs,” DOI Press Secretary Heather Swift said. “He looks forward to working with local stakeholders on a variety of issues under the Department’s jurisdiction,” Swift said. And despite some Republicans being outspokenly against ESA regulations, Zinke himself has not said anything about repealing the act since taking on his role as interior secretary. Zinke has, however, already overturned a federal ban on hunting with lead ammunition in national parks and wildlife refuges that the Obama administration issued the day before Trump took office. Lead poisoning kills as many as 20 million birds and other animals every year, the Center for Biological Diversity said. Meanwhile, the Yurok Tribe says the condor program is moving ahead as planned, spokesman Matt Mais said. If the results are favorable, condors could very soon return to the heart of the bird’s former range. The USFWS and NPS are also continuing to move forward with the assessment, and no budget cuts to any programs have so far been made for this fiscal year, said a member of the USFWS public affairs staff. A big part of the reason the reintroduction program is continuing to move forward is because the Yurok Tribe has created a diverse group of stakeholders that support the project—including the region’s largest timber company, according to the tribe. 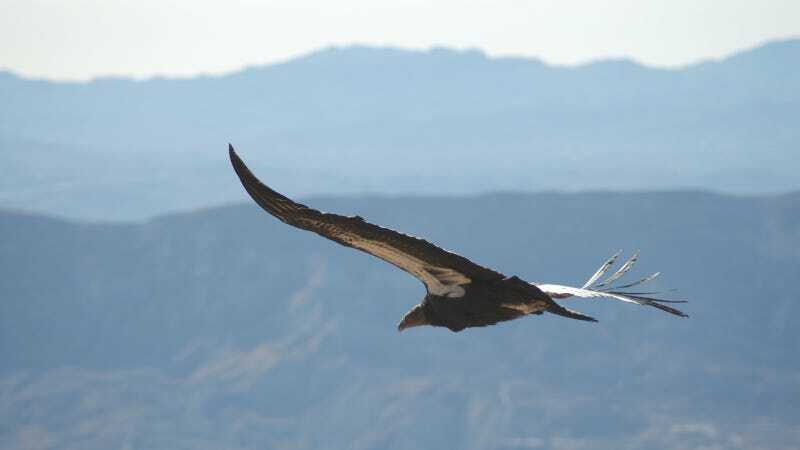 One reason the project may have garnered such wide agreement among local, state and federal stakeholders is because the condors wouldn’t be listed under a standard ESA designation. Instead, they’d be designated as an “experimental nonessential population” which wouldn’t require the kind of across-the-board ESA protections that often cause Republican and landowner opposition. One example is that under the standard ESA label, all logging in the California condors’ range would likely be banned, the National Audubon Society reported. That would almost certainly mean the timber company wouldn’t be on board. Of course, America’s national bird, the Bald Eagle, was careening towards extinction before it was listed as an endangered species and eventually recovered. It faced some of the same threats as the California condor—loss of habitat and poisoning by chemicals like DDT. Under that protection, DDT was banned, killing eagles was outlawed, and nest sites were protected. Now, the Bald Eagle has recovered so well it’s not listed as endangered anymore. Experimental populations are designated threatened, not endangered, under the act. This means the recovery of the species can be achieved without subjecting private landowners and other stakeholders to ESA liabilities. With a flexible plan in motion, the Yurok are hopeful they will see condors flying over their land again. “To us, he is the king of the sky,” Yurok Tribe Chairman Thomas P. O’Rourke, Sr. told the National Audubon Society. They plan to reintroduce the birds in a sparsely populated coastal area in the Redwoods and studies carried out by the Yurok Tribe’s biologists indicated the habitat there is still healthy enough to support condors. What’s more, long-term studies by the biologists found that the Klamath River area was not contaminated with lead to the extent that it would harm scavengers like the condors. For now, all signs point to the continuation of the plan. “The condor, or 'prey-go-neesh' as it is called in the Tribe’s language, plays an irreplaceable role in the tribal traditions and in the ecology of the redwood region,” Mais said. The California condor reintroduction is important to the tribal culture—which considers the bird a sacred animal. Even though they had disappeared for a century, the birds’ feathers were saved and passed down through generations. The condor feathers are used in the tribe’s World Renewal ceremony where Yuroks pray and fast to balance the world. “No world can function and stay in balance until it is whole,” O’Rourke, Sr. added.